Threadlocking products prevent self-loosening and prevent loss of clamp load due to vibration and shock loads. They are easy-flowing liquids which completely fill the gaps between mating threads. When used to assemble threaded fasteners, Threadlockers secure threaded assemblies and eliminate corrosion by creating a unitized assembly. 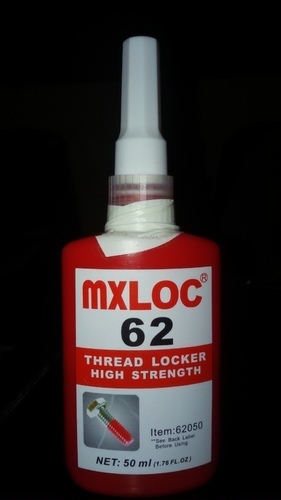 Threadlockers are single-component liquid and semi-solid adhesives. They cure at room temperature to a hard solid thermoset plastic when applied to metal fasteners and in the absence of air. The adhesive completely fills the gaps between mating threads to lock threads and ensure consistent clamp loads. Shree Luxmi Impex operates nationally with a well-balanced and diversified portfolio. The firm holds leading positions with its various business units in industrial businesses thanks to strong brands, innovations and technologies. Shree Luxmi Impex is one of the national leader in the adhesives, abrasives, paints, speaker parts market – across all industry segments nationally. In its Adhesives business, Shree Luxmi Impex holds leading positions in many markets and categories around the India. Shree Luxmi Impex employs more than a passionate and highly diverse team, united by a strong company culture, a common purpose to create sustainable value, and shared values.